A delicious, fresh sparkling wine made in the Method Traditionelle. There is a light bready, yeasty note to the wine which also appears on the palate along with a touch of ripe lemon and brioche. The wine is dry, with a fine mousse, and fresh without the austerity of Champagne but retains an uplifting freshness reminiscent of its upland origin. Tasted 7th of March 2013 at the Sportsman. Delightful crisp and gently aromatic white with a light to medium body and long fresh finish. 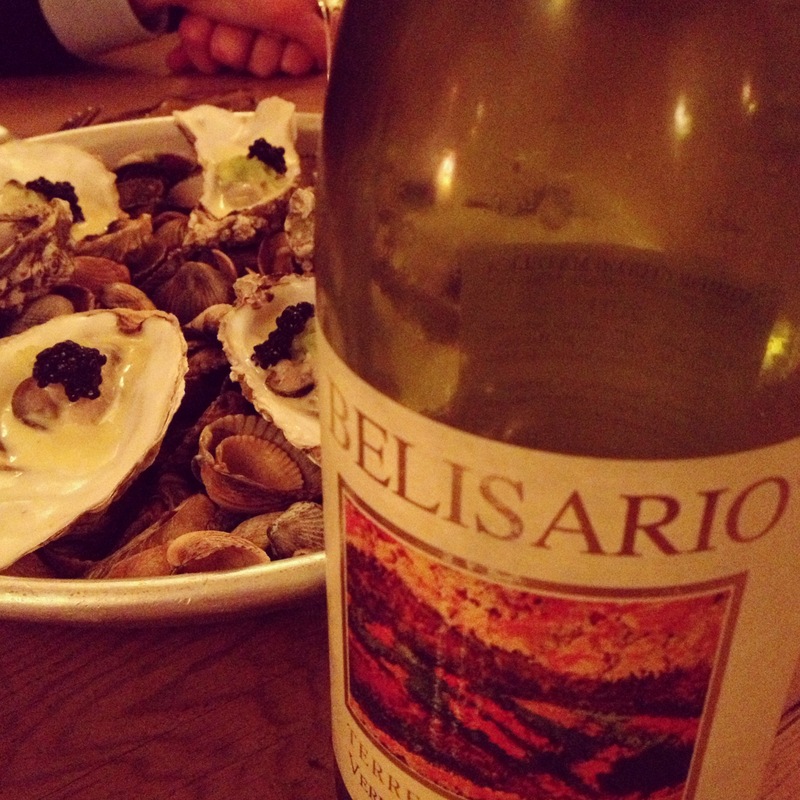 The wine was wonderful match for both raw and baked oysters. Tasted 7th of March 2013 at the Sportsman. A black cherry fruited wine with focus on fruit and a light yet sustained tannic underbelly. Slightly overwhelmed by the risotto it was served with, but fine on its own. Tasted 7th of March 2013 at the Sportsman. Another expression of the Montepulciano grape but this time with more body and tannic structure. The fruit was dark berry, chocolate and leather. Its depth and spice a fine partner for pigeon risotto. Tasted 7th of March 2013 at the Sportsman. A pleasing, medium bodied wine with good breadth and freshness but lacking the mineral core to partner the sea bream it was served with. Tasted 7th of March 2013 at the Sportsman. A fine example of the style with a silky texture and some savoury, nutty notes to counterbalance the ripe pear fruit. A good partner for the bream with the extra weight and depth required. Tasted 7th of March 2013 at the Sportsman. 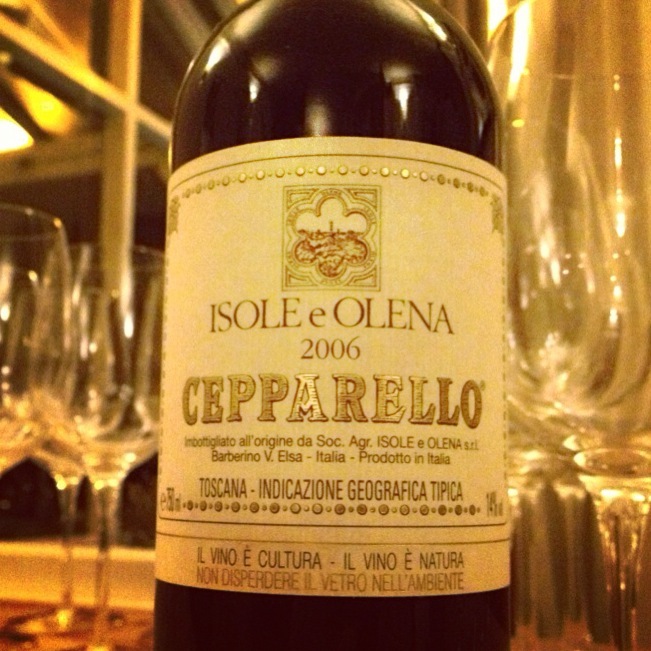 A stylish, Chianti offering good density and concentration with flavours and aromas of dried herbs, cherries and cedar. Long and powerful, still in need of a couple of years to mellow and integrate. Tasted 7th of March 2013 at the Sportsman. Terrific wine with fine, complex and sensual aromatics giving an array of dried red fruits, spices, herbs and sweet leather. The characters evolved in the glass yielding up further aromatic notes. The palate was clean, bright and intense. The fine tannins were in harmony with the elegant fruit, acidity. This is a very well balanced wine, drinking exceptionally well now and with a good 8 years ahead of it. And the closure is a stelvin! Tasted 7th of March 2013 at the Sportsman. A powerful , dense, tannin driven wine supported by dark black fruits and a hint of mint. A sort of St Estephe of Italy. Really well done and just getting into its stride. I first tried this wine 2 years ago and found it too tannic, time seems to have worked its spell. Tasted 7th of March 2013 at the Sportsman. The aromatics are of honey, caramel and dried figs and dates, there is a touch, just a touch, of oxidation to bring complexity. The palate is intensely flavoured and very sweet and lush but is cut by a fine fresh acid and delivers a long harmonious finish. Tasted 7th of March 2013 at the Sportsman. Gulfi, Ceruosolo di Vittoria, DOC 2011. Organic. The Gulfi estate is very highly regarded in Italy and it is easy to see why after tasting this wine. It is full of character giving a real juicy mouthful with freshness and ripeness in equal measure, the tannins give a light grip and the marked acidity the freshness, the fruit is black cherry and fig. Gulfi is renowned as a Nero d’Avola specialist, with several single vineyard wines in production, but the Ceruosolo is a blend of Frappato and Nero d’Avola. The wine performed well on its own but missed out to the Marsannay as the best to accompany the duck.